One of many in Dade County and this newer style version was located in the southwest corner of 79th Street and 27th Avenue, formerly occupied by Frank n Bun further to the right. I occasionally dined at this one while working at Sears in late 1965/early 1966 and the early 70s at Northside Shopping Center on the northwest corner of this intersection. My first dining experience in a Royal Castle was on NE 2nd Avenue near 79th Street in the mid-50's and I fell in love with them. The early ones were not air-conditioned and I remember flies galore. The counter and grill guys were ex-servicemen and many had tattoos on their arms. They either wore sailor hats or white paper hats along with white t-shirts with the sleeves rolled up with cigarette packs tucked in. I remember the grill guys smoking while they were flipping burgers and mashing out the grease. If they kept their cigarette ashes out of the burgers it was a miracle. A lot of these guys were real characters and it was entertaining to watch them and listen to them. Fortunately they built an air-conditioned restaurant in west Hialeah after we moved out there in 1957 and I was able to savor their yummy burgers, birch beer, honeybuns and jelly donuts for years. I remember the hamburgers at 15 cents, birch beer at a nickel and later 7 cents, and great jelly donuts and honeybuns for 10 cents. The jukeboxes on the counters were cheap at a nickel as I recall. Real progress came to the chain when they air-conditioned all of their restaurants and started hiring women in the later years. A hamburger restaurant where black customers once were banned has become a touchstone for the community. Phillip Henderson, 58, a cardiovascular technician, and Harry Renkoff, 61, an insurance agent, enjoy breakfast conversation at James Brimberry's Royal Castle on NW 79th Street and 27th Avenue. Video Goldie's Conch HousePhoto slideshow "Over the years, things changed"Three emotions took Barbara Johnson when she saw the Royal Castle sign. First, shock. Royal Castle still exists? Then, hunger. I could use one of those good old hamburgers. Then, delight: I've never seen so many black people at Royal Castle in my life. When Johnson, 62, was growing up, she could only gaze from the outside at a Royal Castle restaurant, looking in as white people bit into palm-size hamburgers and drank birch beer. Back then, blacks could get service only through a small side window. "When I found out it was open, I just had to come in and sit down," Johnson said. "Because, you know, we couldn't sit down here until '65." 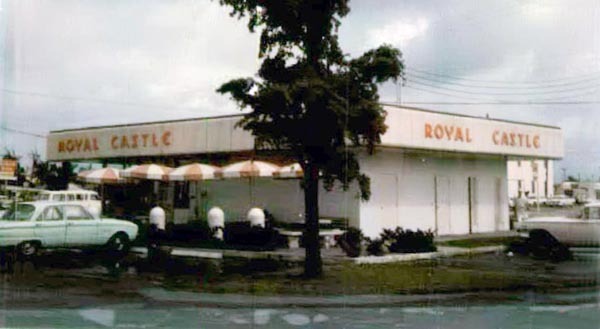 Royal Castle was once a Miami-based chain of restaurants. Now it's down to one -- at Northwest 79th Street and Unity Boulevard. Founded by a Jewish family from Ohio, the store is now in the hands of a black man from Miami. And with the new owner, who started at the restaurant flipping quarter-inch-thick meat patties, Royal Castle became woven into the culture of black Miami -- the very group that was banned from dining there for decades. The architecture still looks much as it did in the old days. At sunrise, the store's original "Royal Castl" glows over backlit white tile. Ten silver stools stand at the red and white counter. A '60s-era poster for Coca-Cola hangs on the wall. "Original Royal Castle Burgers Sold Here" is painted on the windows in orange bubble letters, a reminder that the bestselling product here is nostalgia. William Singer got the idea for Royal Castle in Columbus, Ohio. The only restaurant that stayed afloat there during the Depression, he would say, sold small hamburgers for pennies. It was a quaint chain called White Castle. Bankrupt and desperate to be an entrepreneur, Singer tinkered with the name and took the idea to Miami in 1938. By 1958, Royal Castle had grown to 58 stores in South Florida. They thrived in working-class, mostly white areas, where families bought the greasy patties layered in onions, pickles and mustard by the dozen. Under Lawrence Singer, William's son, the chain blossomed to at least 185 stores concentrated in Miami-Dade County, with a few in Georgia and Louisiana. All had strict rules. No more than 10 stools at the counter. No women behind the counter. No blacks sitting in front of it. "We're following a social custom of long standing," Lawrence Singer told The Miami Herald in 1961. "Our policy is not to serve Negroes at the counter." In the late '50s and '60s, sit-ins popped up throughout Miami. One Liberty City resident, James Brimberry, recalls waiting in Woolworth's to be served, only to be kicked out. He picketed department stores such as Burdines until he joined the Army. "We were fighting for equality," Brimberry said. "We didn't necessarily want integration. That was George Wallace's word." The local chapter of the Congress of Racial Equality targeted Royal Castle. In January 1961, managers removed two black girls from seats at the counter. "You wonder how we could have even allowed such things," Lawrence Singer, now 84, said. "They were terrible and horrible things. ... But when CORE started picking on us, we were actually starting to be trailblazers with integration." In July 1964, after President Lyndon Johnson signed the Civil Rights Act, the Singers sent word to employees: Blacks were now allowed at the counter. And the company needed to find black managers, quickly. On Aug. 16, 1964, Royal Castle hired James Brimberry. Straight out of the Army, he was desperate for a job. "They needed a black face," Brimberry said. "And being from the military, they knew that I would be able to withhold animosity and my tongue and my anger, and deal with some of the things that would be thrown in front of me." Brimberry tried to be flawless. He always arrived on time. He spoke with perfect grammar. He kept his white uniform clean. Within months, a white customer refused to eat the food Brimberry served, and spewed a racial slur at him. Brimberry said nothing. But his ambitions changed. He said to himself: "One day, I am going to own this company." In the late '60s, as profits sagged, the company tried new marketing tricks. Royal Castle lowered the price of its 19-cent burger to a nickel in 1968 after The New York Times reported President Richard Nixon saying, "What the country needs now is a good five-cent hamburger." Then, The New York Times issued a correction. Nixon really said 50 cents. It went to show that cheap burgers were no longer in fashion. In the midst of a family dispute, Singer grudgingly sold the company to Minnie Pearl, a comedy star at Nashville's Grand Ole Opry, in 1969. The menu expanded to include breakfast, but nothing could keep the chain afloat. On Aug. 29, 1976, the company left the name and eight stores to the last person on the payroll, then the assistant manager of operations. His name was James Brimberry. Over time, Brimberry sold seven stores. Only one of them, at Northwest 125th Street and Seventh Avenue, got to keep the name -- after a legal battle that Brimberry lost -- but it burned down in 2005. Brimberry is 66 years old now. Bald with a gray beard, he walks through the restaurant with a cane, a cowboy hat and snakeskin boots. "I dress like this so I can tell people the story," he said. "The original cowboys were black. ... We have to hold dear to our history." Brimberry also thinks there are some things that have to change. Six of his 14 employees behind the counter are women. Almost all the people in front of the counter are black. He has added "country food" to the menu: grits, runny eggs, soupy eggs, pork chops, ham. The best seller is the $10.99 T-bone steak. "This is our food," said William Houston -- nicknamed "Slim" -- who started coming to Royal Castle when he was a bus driver 30 years ago. Now retired in Miramar, he's still coming. "All my friends come to this store to sit and talk about everything -- the news, our lives, politics. Jim, we know him. He won't kick us out. We feel like it's our own." He sat next to his friend J.C. Sears, a retired truck driver with a big laugh and belly. As Brimberry approached, Sears eyed him and said: "If it weren't for you, I wouldn't be in the shape I'm in." A stream of customers came and went, in wonder. "My grandfather used to have breakfast at the Royal Castle in Cutler Ridge every Saturday, and I'd be with him,'' Bennette Moultry, 47, of Cutler Ridge said. "I come in here, and, wow, it just reminds me of him." "My husband, he loves the hamburgers," said Theresa Williams, 51, as she ordered half a dozen. "It gives him gas, though. Still, he wants it. I buy it because I love him." And Reggie Brown, 29: "I could go to McDonald's, but I like this place more. It's black-owned." Brimberry also has a catering company, and he works as a real-estate agent. "This place is nothing but business to me," he said as he sat at Royal Castle's counter. "Just another business." He slouched, then looked in the direction of the side window, the only place where he himself could get a burger in the old days. Tears welled. Years ago, the window's glass was knocked out; it was boarded up and painted over. "You know, I have to admit, there is a sentimental value to this place," Brimberry said. "This is Royal Castle." The Royal Castle in Dania on US1 and Dixie Hwy. was on the corner of my street. I could smell the onions cooking from my bedroom window. My girlfriend and I would stop almost everyday after school for a nickel birch beer. Please don't say that a Krystal is close. There is no comparison burger out there today. Somebody mentioned not seeing any white castle hamburgers here in Miami. There was one by Miami High on 27 Ave near 1st street. I worked at the Royal Castle in Union Park in 1972-73. I still have a picture taken of me behind the counter with donuts in the shelves behind me. I knew nothing of the history at the time and at 18 years old, I didn't really care. I went by there while visiting Disney a couple of weeks ago and the building still stands. It is now a Chinese Restaurant that I believe has also gone out of business. I have tried to get a history of the building but have not had much luck. I did take a couple of pictures this trip. I don't have any of the outside from that time. I'm a retired cop from Miami. RC was a great friend to cops as they supplied coffe to the patrol guys especially working the midnight shift. Back when they were in operation, 50/60's, RC had a special window to the side where a police car could just pull up and park and go to this little window and get a cup of coffee without having to go inside. We didn't have hand held radios so we'd leave the car door open to listen to the radio while having a cup of coffee. I had many meals also at Royal Castle because my salary wouldn't let me eat any fancier. I don't think too many RC's were held up then. If I remember correctly as soon as the RC's went out of business, White Castle came in and then Toddle House came in. I'm going back quite a few years. MY MOTHER UNTIL 1976 WAS THE MANAGER OF THE ROYAL CASTLE CORNER OF CLEVELAND AVE AND VICTORIA IN FORT MYERS I AM SO HAPPY TO SEE ONE STILL EXIST. MANY WONDERFUL MEMORIES OF THE ROYAL CASTLE AND THE FOOD BIRCH BEER ORANGE JULIUS BABY BURGER WHAT I USE TO CALL THEM AND CHILI WOW YOU COULD GET A HAMBURE CUP OF COFFEE AND CUP CHILI FOR LESS THEN 1.00 . WHEN THE EDISON LIGHT PARADE WAS GOING ON CUSTOMER WOULD LINE UP THREE TIMES AROUND THE BUILDING TO GET THE BURGERS . WOW WOULD WE WORK HARD LOL BUT IT WAS SO MUCH FUN . I SURE MISS THOSE BABY BURGER AND BIRCH BEER . SIMPLY THE BEST THANKS FOR HOLDING ON TO THE TRADITION AND WISH YOU MANY MORE YEARS OF CONTINUED SERVICE TO THE COMMUNITY. There use to be a Royal Castle in St. Petersburg Florida on the SW corner of 16 St and 22 Ave No back in the 1960's A doctor's office sits at that location now. Well said, Jessie, and thank you for posting your sentiments about Mr. Brimberry. All hats off in a salute to Mr. Brimberry! Once upon a time there was this genial giant of a man name (James Brimberry) with a vision. A vision that went from unemployment to entrepreneurial. I am very happy for his achievement, hard work and good fortune. "When one of us win, we all win." Congratulations are never to late! My father worked in HVAC and I remember him working on a number of RCs. I used to eat regularly at the RC on Sixth Ave. near what was Mae's Beauty Salon. My mother and aunt would go to get their hair done on every other saturday. I went with them because I spent time in a thrift shop called Brownie's sifting through the ton of used comic books he had. But the highlight was eating lunch by myself in the Royal Castle. Like many RCs at that time, they employed a lot of vets. The hamburgers were the best of course but no one has mentioned the choc shakes, sort of like a frostee but made from real ice cream. Later we moved to Hollywood and I ate often at the Hollywood Blvd and 28th ave RC. After HS, I would meet up with a friend later at night and eat at RC. There were always odd folks in there especially at 3am. I distinctly remember walking in one early morn and there was this hugely fat guy sitting at the counter. He just spilled over the stool until it disappeared. What was interesting to us was his small revolver tucked into his back pants waistband. We almost left but heard he was a private detective in his conversation with the counterman. I run the downtown Clearwater Florida location now known as Angie's Restaurant. This was previously a Royal Castle, and I love the design of my building. Do you by chance have any old schetches or drawings? My dad Roy Wolfcale and Joe Smith were the architects hired by the Singers to design the Royal Castles in the late 50's and early 60's. Their office was in the Olympia Building in downtown Miami. The newer prototype design introduced around 1960 was very modernist - lots of glass, clear anodized aluminum mullions and white metal panels. Roy and Joe moved to Atlanta in 1963 and a couple Royal Castles were built there. The last one on Courtland Street survived until the early 90's as a car rental office. I worked at the Royal Castle in Hollywood in the late 60's and early 70's, at the Castle on Hollywood Blvd and 28th. The manager was Garland Victory, the lady the worked the night shift was Marie Washburn. I think about all the people I worked with there and wondered where they are now. I would love to hear from anyone that worked there during that time or was a customer. I was born in Lake Worth, FL. Lived in Fl ti I was almost 10. I remember them as a kid. They were so darn good. They use to have FRESH SQUEEZED OJ. It was so refreshing!!!!!!! Wish they still had them. I forgot to mention that this was in Cleveland, Ohio. I remember the two Royal Castles that I frequented most, one was on the north side of St. Clair Avenue just west of Five Pointes (St Clair Ave, Ivanhoe and 152nd St.) and the other on East 185th Street. As teenagers my friends and I would buy a brick (six burgers) and a Birch Beer after baseball practice. A third Royal Castle was on the north side of Euclid Avenue just east of Playhouse Square. This was in the mid 1950's. I grew up on Royal Castle hamburgers, and it was a treat when my father took us to the Royal Castle at 66th Avenue and Taft Street in Hollywood, just a few blocks from our house. For years after Royal Castle closed, my father drank his coffee from a "liberated" Royal Castle mug, which is still in the family. My cousin has it as a memento of her "Uncle Dickie". I have Krystals, and I've eaten White Castles, but it isn't the same. And I would pay a king's ransom for a birch beer in a frosty mug. Don, thank you for writing in and reminding me of that chocolate pie because I loved it too and had forgotten about it while thinking of the burgers, birch beers, honey buns, breakfasts, etc. There was one in Boca on the corner of 20th St. and Federal Highway.....it's an Italian take-out place now....my best friend and I used to peddle our bikes there EVERY Saturday to chow down. My Dad was a professional chef and hated fast food joints so it was the ONLY time I got to eat burgers.....no one has mentioned the CHOCOLATE PIE! It was probably horrible but at 10 years old it was heaven. I'm an antiques dealer now so I get to COLLECT early Royal Castle stuff! Keeping the dreams alive! I lived in Miami from 1952 to 1954 and remember buying Royal Castle burgers for 15 cents. I still remember what they tasted like--delicious! I wish I could have them mailed to me here in California. In high school in Tampa, I ate at the Royal Castle on Dale Mabry Hwy almost every day...remember the look and the smell of the place. Was sad to see them close down. As a memento, a few years later I stopped at one in Gainesville on my way to Atlanta to eat. I knew the company was going under and wanted one of the coffee mugs, the waitress wouldn't sell me one so I just put it in my pocket and left a five dollar tip. And I was reminiscing last night when I looked at the mug which I have had for 35 years. i remember stoping by the royal castle in hialeah, fl on my way to school, miami springs jr. high back in the day. today, 39yrs. later i can still remember the smell walking in and sitting at the counter. kristals rest. cannot hold a candle to the royal castle i remember. I lived in New Orleans in the late 50's and remember a Royal Castle on the corner of Airline Hwy and David Drive. I don't know why, but I also remember their theme song that played on their radio ads. There were two Royal Castles in South Euclid Ohio ( a suburb of Cleveland) in the 1960's. I still have one of their original coffee cups. RC's were big in Orlando in the 60's too. SMS: we love the In 'n Out burger chain and I have plenty of friends here on the east coast who love them too every time they venture west. And yes they are far better than anything McD's and BK has ever served in their history. Bill - I've lived here since 1951 and I don't ever remember a White Castle down here; I discovered them for the first time when I was stationed in Baltimore in 1966/67. Every time I drive around Hollywood when visiting from California, I see the old Royal Castle buildings, many of which still look the same. US1 in Dania, 441 & Hollywood Blvd., and 28th Ave and Hollywood Blvd (Miami Subs), and the one in Davie across from Nova where we used to go before school (that one is the old building left in that shopping center, but it's abandoned). I still remember bits of the Royal Castle Jingle! In the west, the dominant independent chain is In 'N Out which has thrived since 1948 and is far better than BK or McD. i spent most of my childhood years in miami area in the 60's and 70's. there was no white castles there at the time, but there was royal castle. i remember something about them servinv coffee or being open 29 hours a day. i now live in chicage and enjoy slyders at white castle. if they arent the same, they are very close. it sure brings back fond memories of sitting at the stool looking out the window enjoying the little burgers at the rc west of red road and hialeah high school. Guest, do you mean NE 2nd Avenue? NW 2nd Avenue stops going northbound at NW 79th Street and there was a Royal Castle on NE 2nd. I thought I was the only one who could remember this Miami landmark! The one that my mom and I would go to was in Little River on NW 2nd Avenue just north of 79th St. I can still recall the smell of the onions grilling and start getting an appetite for some! After 50 years....how crazy is that? I worked as a driver- dockman at TERMINAL TRANSPORT CO., a few blocks south of this restraunt, in the '60's. I had many a burger there, as I could park the truck in back. This "SITE", brings back many memories. Harvey C.
Around the time Royal Castle was being sold, a new place: "Carousel Burger" opened in N. Miami Beach @ N.E. 167 St. & 6 Avenue and I believe it was owned by Royal Castle in their last ditch effort to make the company profitable again. Does anyone remember this place? It only lasted about 6 months before it closed and was a type of automatic machine which you would tell how you wanted your hamburger and the burger patty would drop on to a conveyor assembly and would come out at the cash register all wrapped and in a bag! I've lived in Miami since 1952 and attended Miami Tech High School, joined the USAF in 1958 and returned to Miami in 1963. I remember eating at this Royal Castle as a kid ( I lived only a couple of blocks from it). When I was a teacher in 1980 I remember driving by it and it had been demolished during the riots in 1980. I REMEMBER EATING AT A ROYAL CASTLE ON THE CORNER OF 107 AND BIRD ROAD WHICH IS NOW A PEP BOYS BEFORE THAT A EVERGLADES LUMBER AND A DAVIDSON LUMBER. IM 38 BUT I STILL REMEMBER EATING THOSE BURGERS AS KID. I WISH THEY WERE STIL AROUND. I remember a Royal Castle in St. Petersburg during the 1960's. There was a Royal Castle on Biscayne Boulevard at about 58th St., diagonally across from the gas station owned by a guy named Scoccimaro. Near Cushman School. I ate there as a kid. One of the best things about working the night shift at Royal Castle was being able to try the fresh donuts and honeybuns that were delivered from the commissary early in the morning. At night at the older stores the local police would prop the back door of the store open so they could listen to the police radio while sitting in the back of the store drinking coffee. Don, I don't know why I just noticed your posting from May here. Pertaining to your comment about how far out of Miami Royal Castle branched out, I well remember the one in Stuart, Florida on the corner of U.S. 1 and Hwy 76 (Now Kanner Hwy) well into the 1970's at least. Then it became a Todd's breakfast place (Excelllent place - now gone too). In Gainesville, where I now live, there were at least two Royal Castle's. One on SW Williston Rd at I-75 which later became the "Chuck Wagon" which was outstanding until Chuck died, now it is another location for the local chain "43rd Street Deli" which is never open when we need it and leaves a lot to be desired for menu selection. The other Gainesville location is near the University of Florida, one business east of the corner of University Avenue and NW 13th Street (U.S. 441). It became a Royal Castle "Key West " version for awhile (the Williston Road location may have also - not sure) and now it is home to the ever worsening "Leonardo's by-the slice." Used to love to eat their miniture hamburgers and the rootbeer floats...we used to go to the one in Biscayne Boulevard and 30 st. But our favorites were the White Castle miniture hamburgers. QUESTION...ARE ROYAL CASTLES STILL IN MIAMI??? BECAUSE THE CLOSEST THING TO IT TODAY THAT I HAVE HAD IS "KRYSTALS"...ALSO BLUE CIRCLES AND WHITE CASTLES...WERE THEY JUST FRANCHISES OWNED BY THE SAME PARENT COMPANY FARTHER NORTH...ANY COMMENTS?? ?